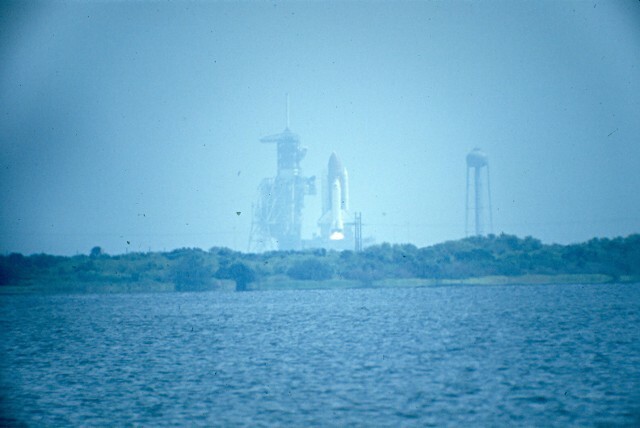 It was a very warm, late morning in Central Florida in June of 1982, when our family returned to the Kennedy Space Center, just a little more than a year after the launch of STS-1, to see the fourth launch of Columbia, on what was billed to be the "final test flight" prior to the Shuttle becoming operational. 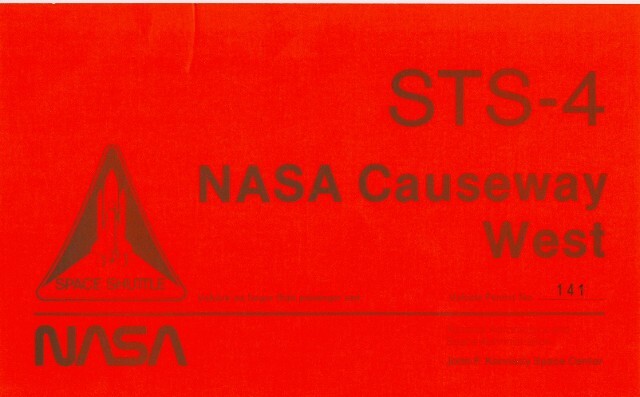 It was also the first Shuttle mission flying a Department of Defense payload, so the security at KSC was much higher than for STS-1. 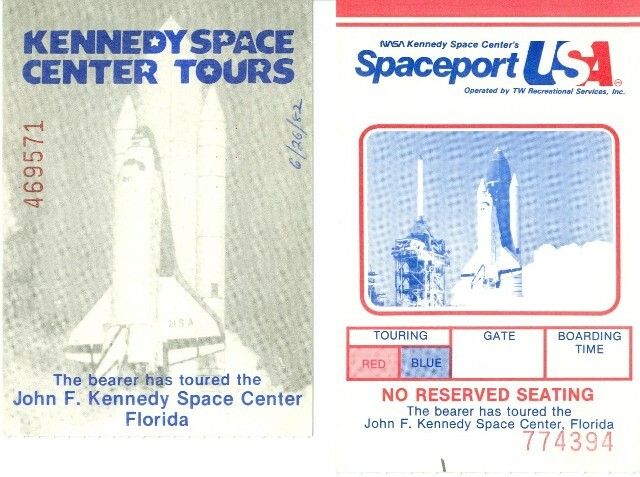 Out tickets to the Visitor's Center the day before the launch. 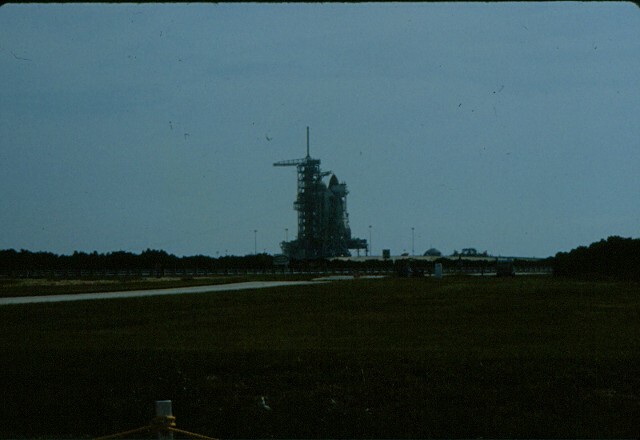 We were trying to repeat our good fortune in getting a late bus tour prior to the close-out of public access to the launch site. 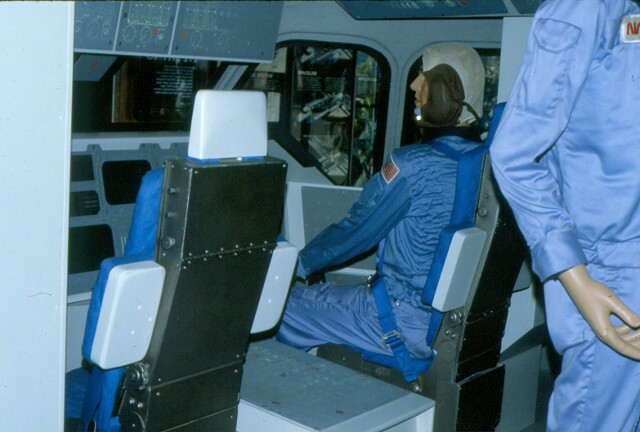 Inside the Visitors Center, a full-size mock-up of the Shuttle flight deck. 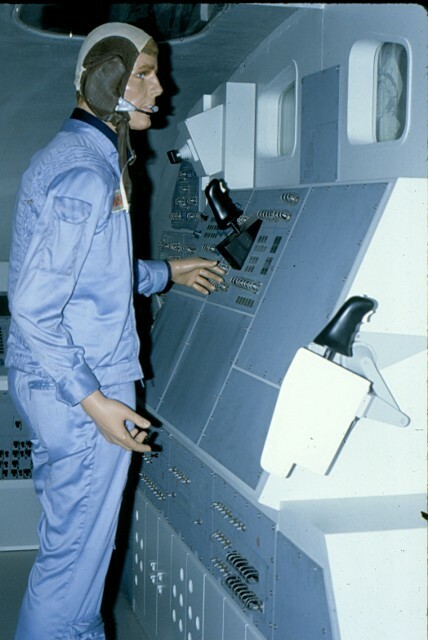 ...a Mission Specialist operates the aft payload station. 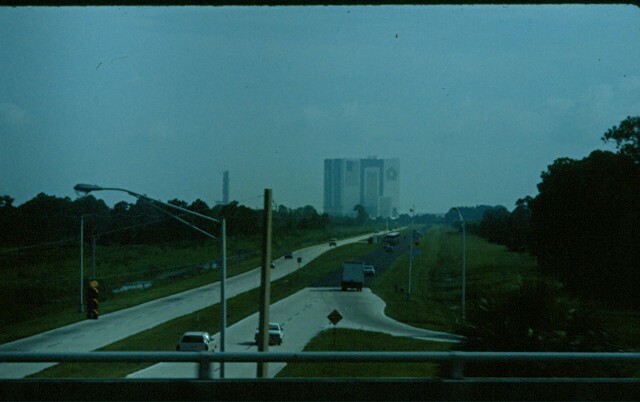 On the bus tour, crossing over State Route 3, which leads up to the Vehicle Assembly Building. The Press Site, already beginning to fill with journalists from all over the world. 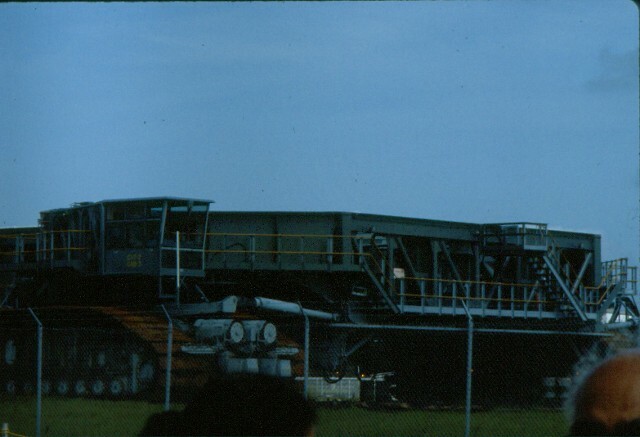 The massive Crawler-Transporter, at her parking site midway down the Crawlerway from the VAB to the pad. 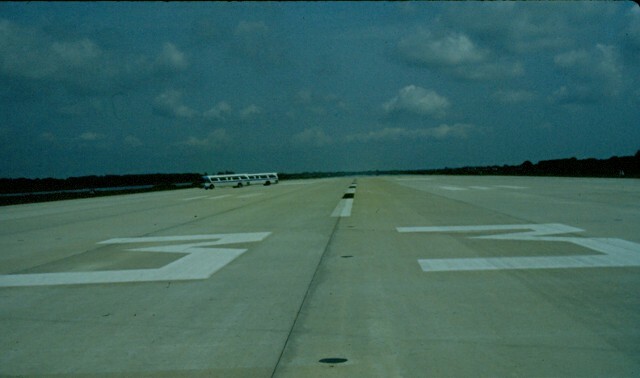 As with STS-1, the Crawler parking sire was the first photo-stop on the bus tour. 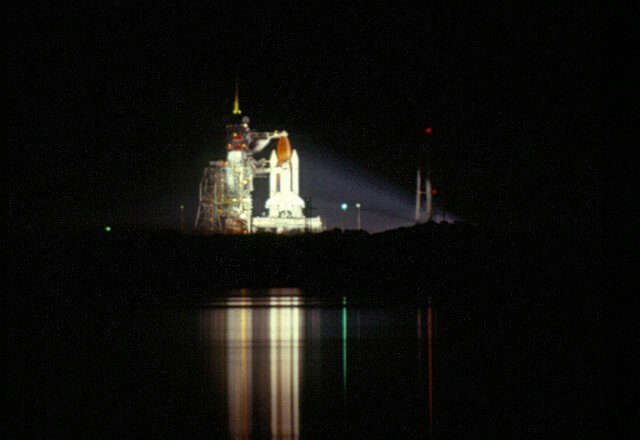 But this time, this was as close to Pad A as we were allowed to go. 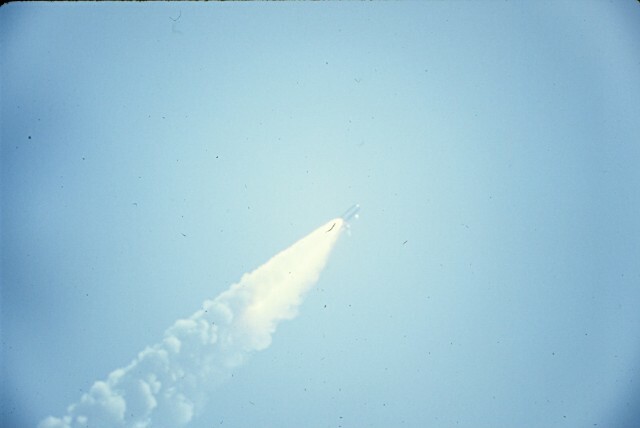 DoD payloads change the security. 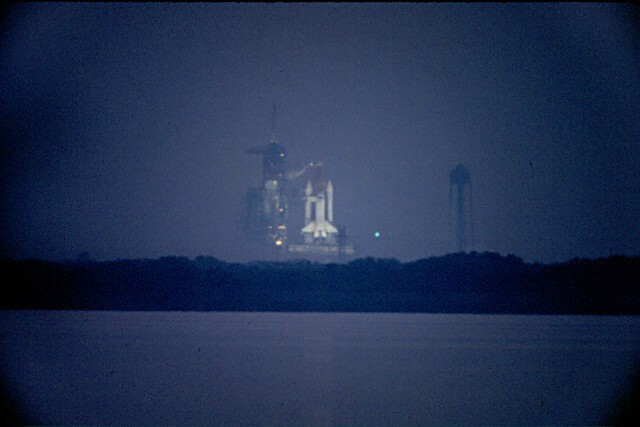 So, we had to use our 270 mm lens to do the best we could from here. 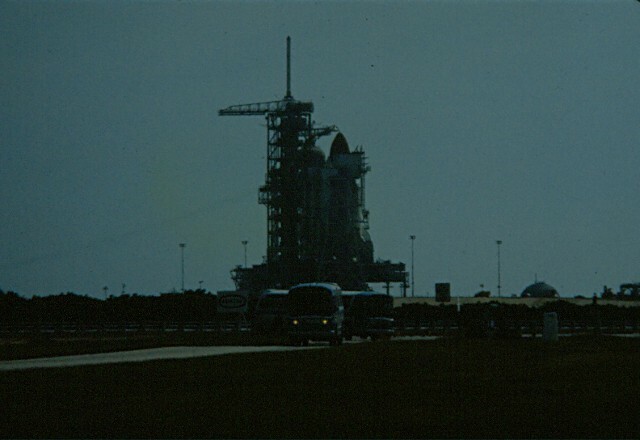 The buses were coming down from Pad B, which would be our next stop as well. 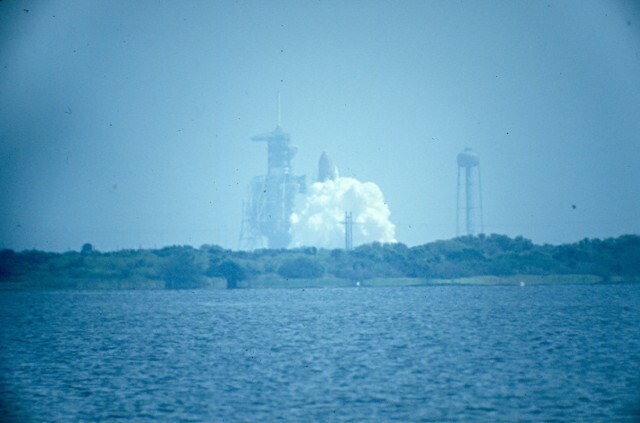 In June of 1982, Pad B was still under construction, in so far as accommodating Shuttle launches. 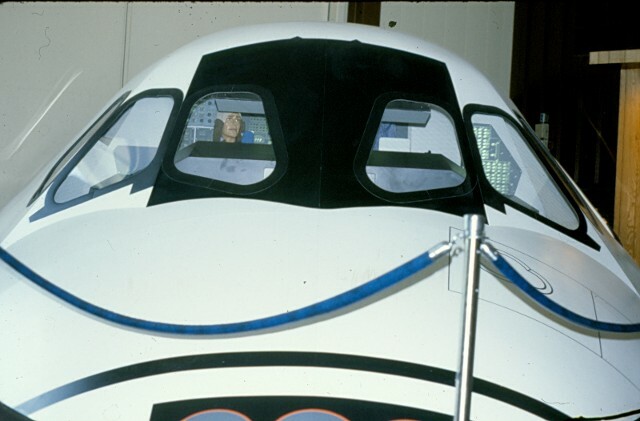 The Orbiter Access Arm, and the oxygen and hydrogen vent arms are yet to be installed. 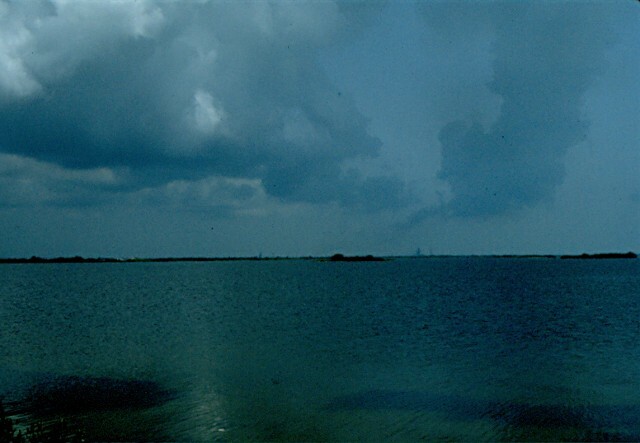 The view of Pad 39-A and STS-4 from near Pad 39-B. 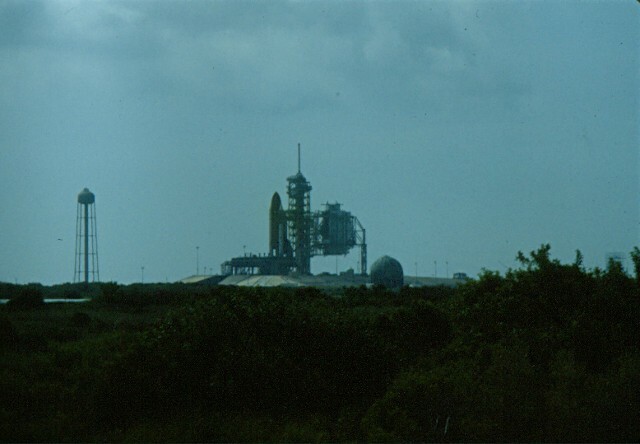 The view of the VAB and Launch Control as we came back down from Pad 39-B. A cluster of two tour buses show just how big it is. 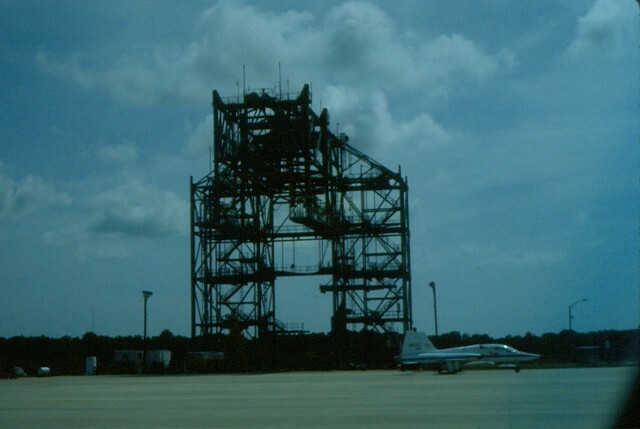 The Mate-Demate Facility, used to mount and un-mount the Orbiter from the 747 Shuttle Carrier Aircraft. 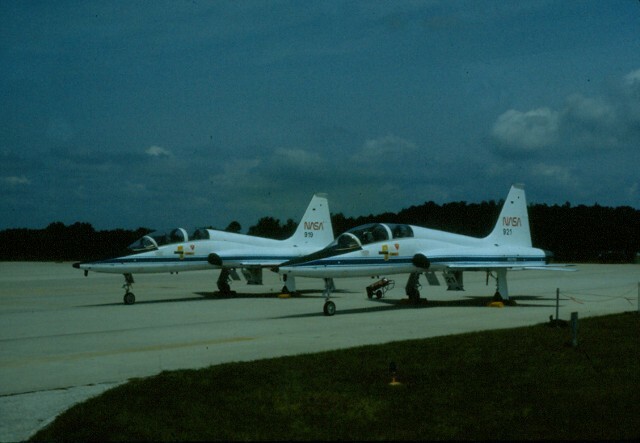 The Northrop T-38s that Astronauts Mattingly and Hartsfield flew from Houston to come to the Cape for their Shuttle flight. 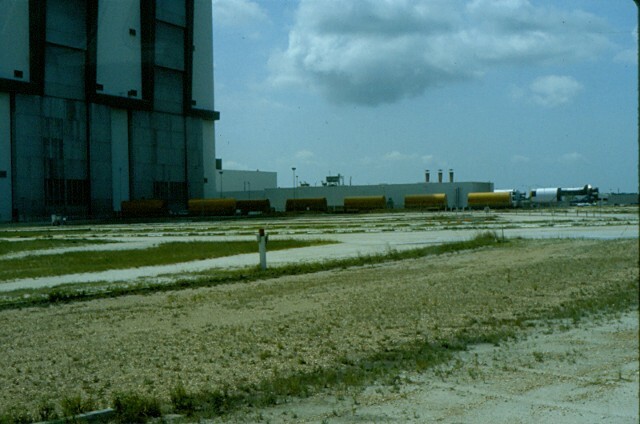 The west side of the VAB and a string of special rail cars used to haul the Solid Rocket Booster segments from Thiokol in Utah to KSC. 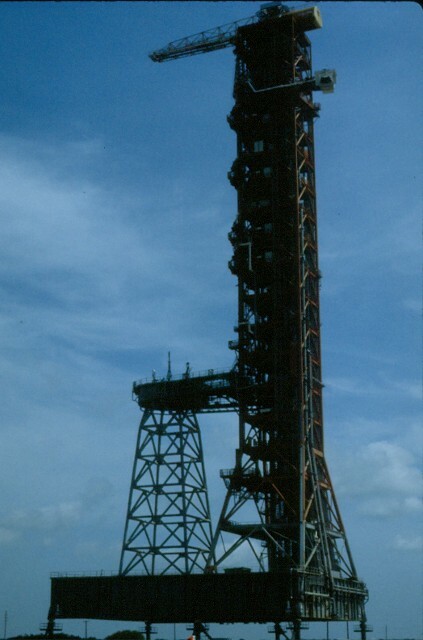 Launch Umbilical Tower #1, still with the "milk stool" used for the Saturn 1B launches to Skylab and the Apollo-Soyuz flight. 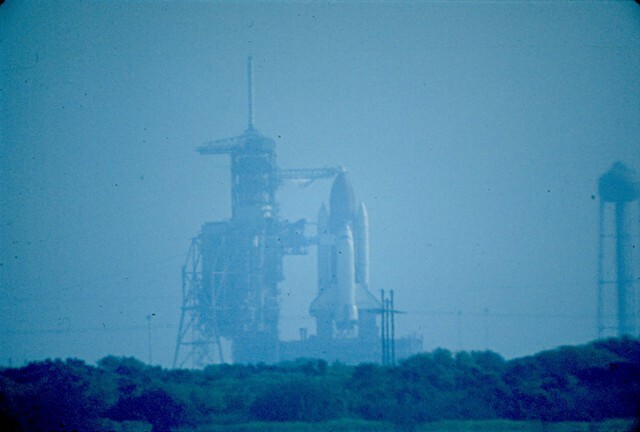 I saw this sitting on Pad 39B in 1977, and here, next to the VAB in 1981. 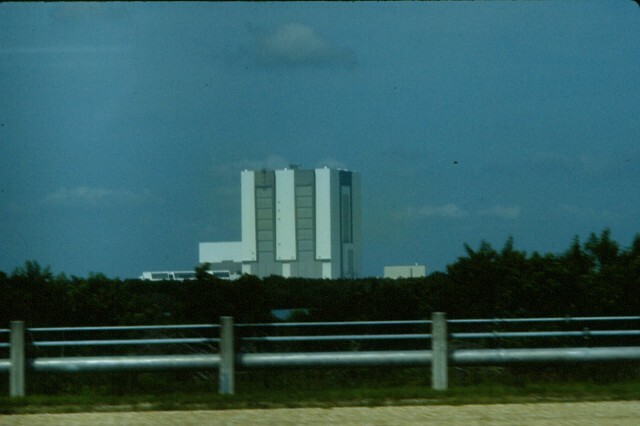 There was an effort to save the LUT as a landmark to Project Apollo, but it didn't work out. 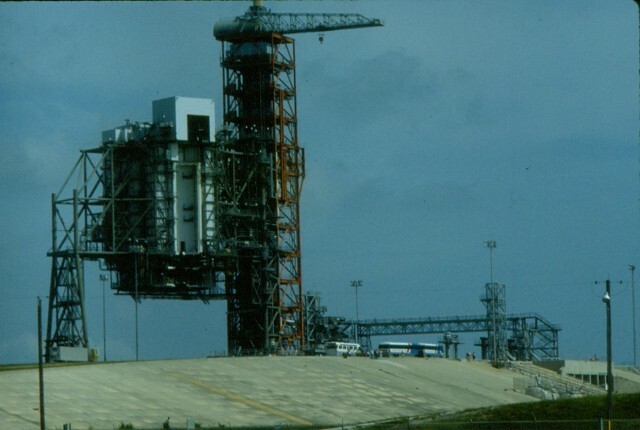 The tower would be scarped out, and the mobile launch platform recommissioned for use in Shuttle launches. 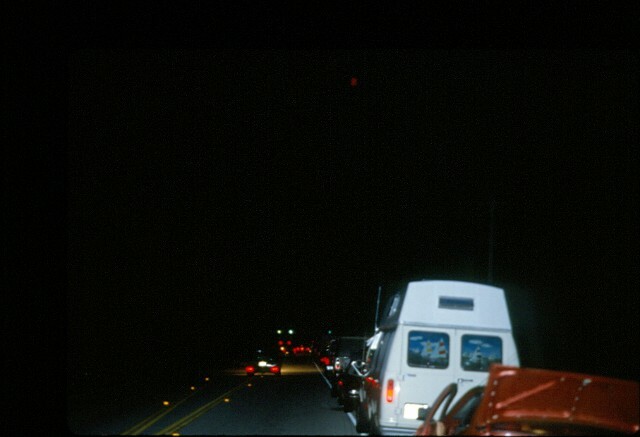 2 AM, June 27, 1982. 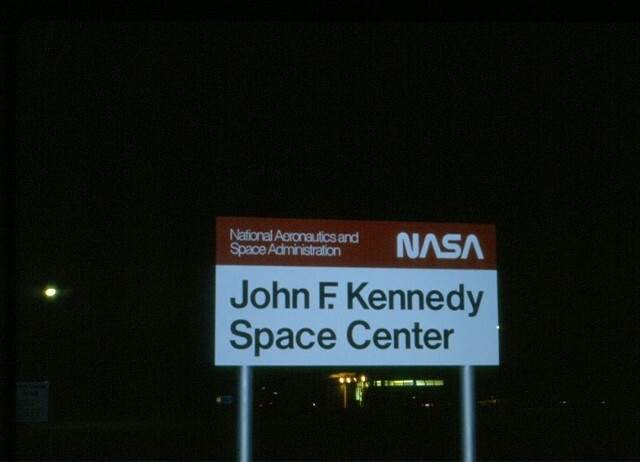 We're on-station on State Route 3 and waiting for KSC Gate 3 to open. 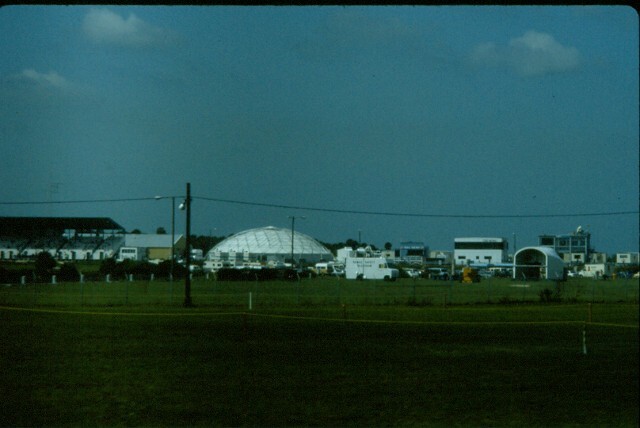 The Press Accreditation Center can be seen below and beyond the sign. 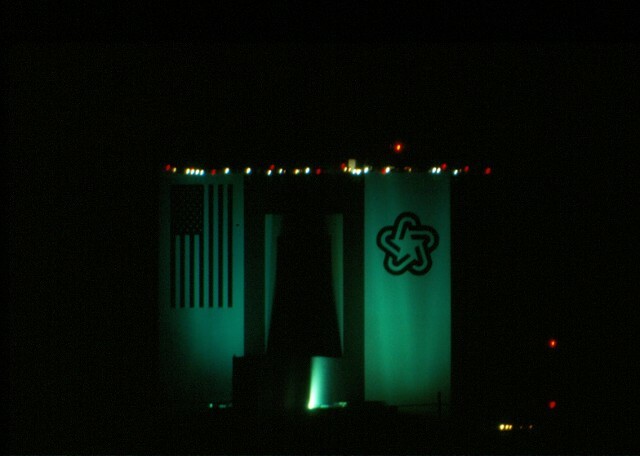 3 AM - Gate 3 opens, and the visitors begin to move slowly through the gate, up SR3 to the NASA Causeway, and east towards the viewing site on the west side of the Causeway bridge. 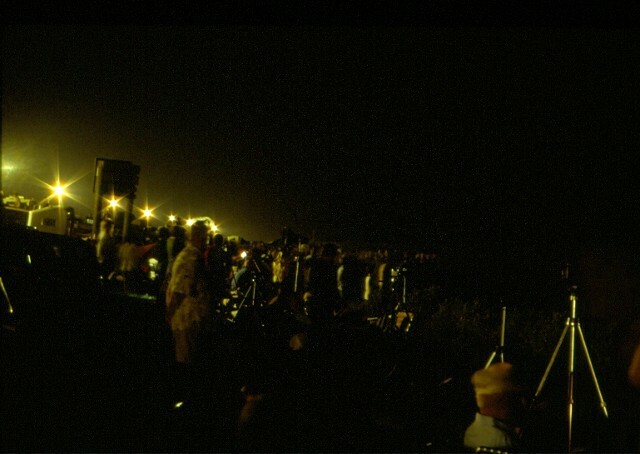 4AM - We are on site and very near the banks of the Banana River, looking west across the assembled crowd. The cars are parked behind us, up the embankment towards the roadway. 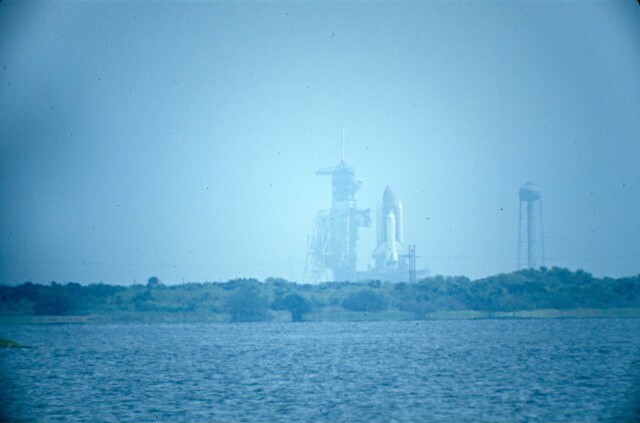 First look towards the VAB, five miles away, using our 270mm lens. The view using a Celestron C5 telescope as a lens. 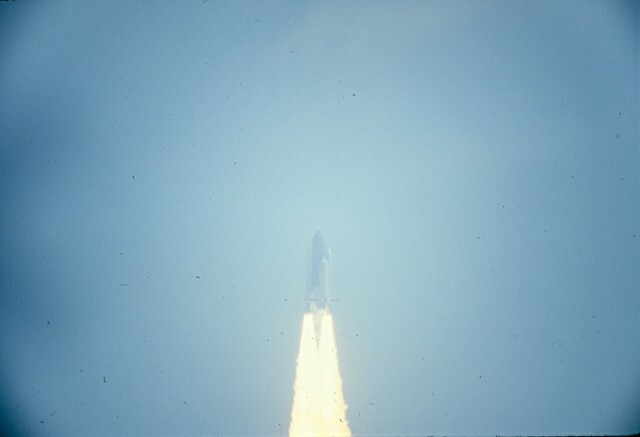 With a doubler, the effective focal length was 1000mm, with good light gathering (f11). 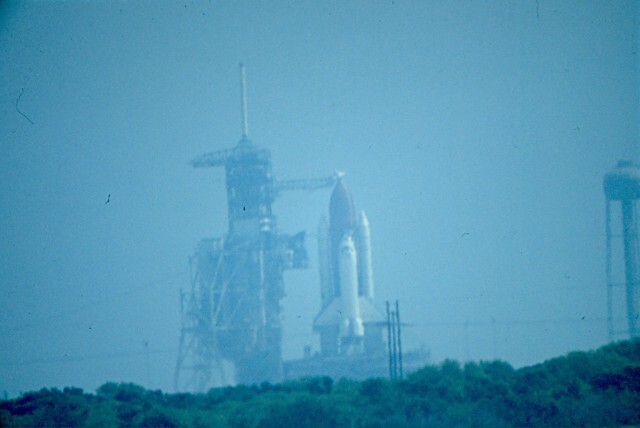 Columbia, poised on th pad for its fourth flight, as seen using the 270mm lens. The Celestron C5, without the doubler was about 500mm, with better light capacity (f5.6). 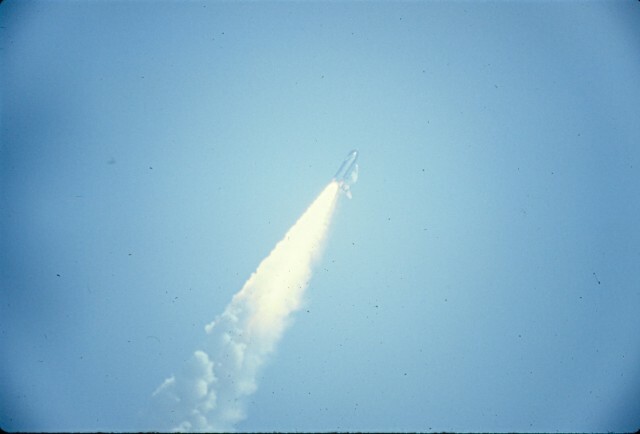 The wider angle would be valuable come launch time. But even with the doubler, with a little more time, the results were quite good. 5AM, and the Sun begins to rise over ocean's edge. Now, we can see just how humid this day's going to be. 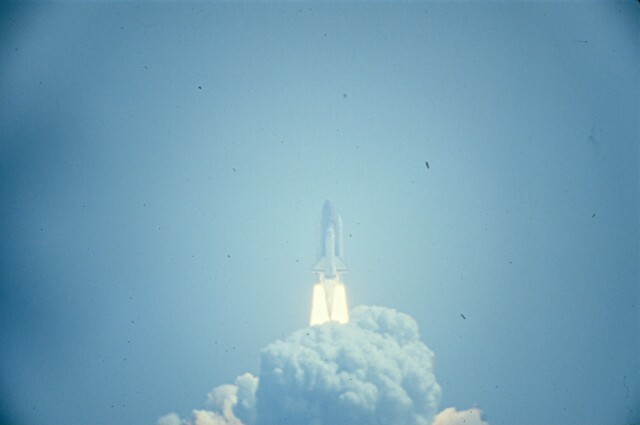 Out of the T-9 minute hold, down to 2 minutes and the GOX Vent Hood is retracting. I decided to drop off the doubler to get a wider field, and more light. 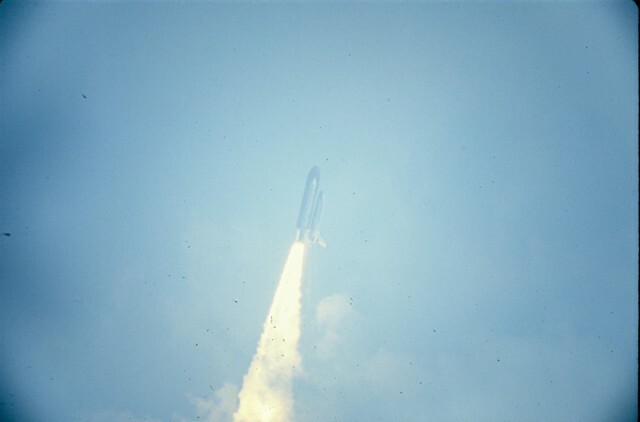 T -6 seconds, and Main Engine Start. 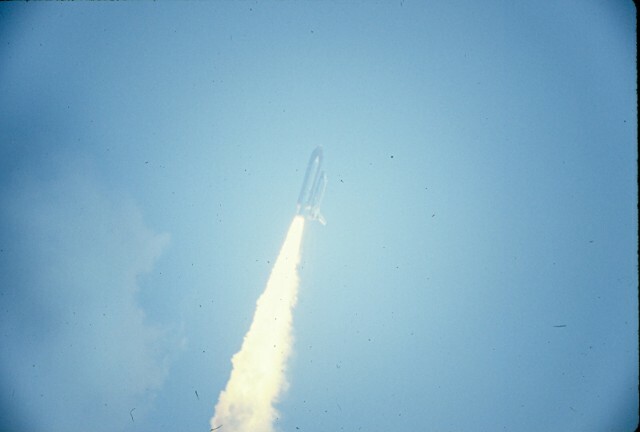 11 Am and liftoff of STS-4. Right on time!! Roll complete and moving out!! The higher Columbia climbs, the worse the aerosol glare becomes. But the water vapor in the air made Max-Q quite a show!! 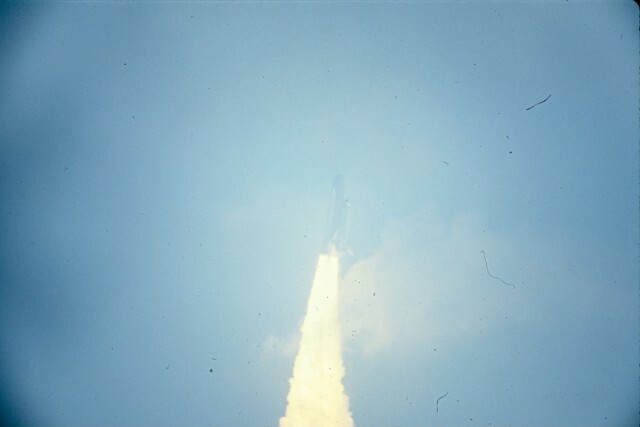 Note the plumes around the SRB and Orbiter's noses. 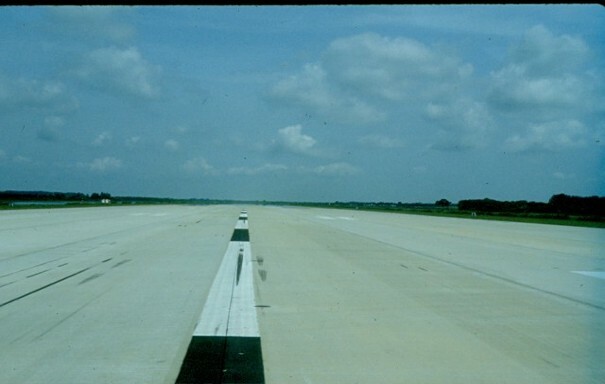 Through Max-Q and go at throttle up!! Our last good view before the glare ate up the camera shots. 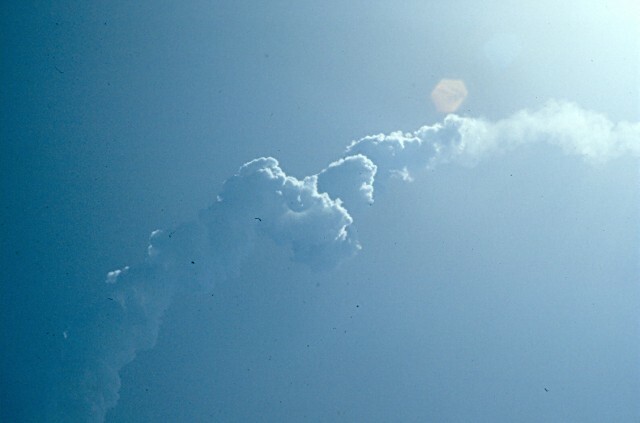 We could see SRB Sep, but could not get a picture of it. 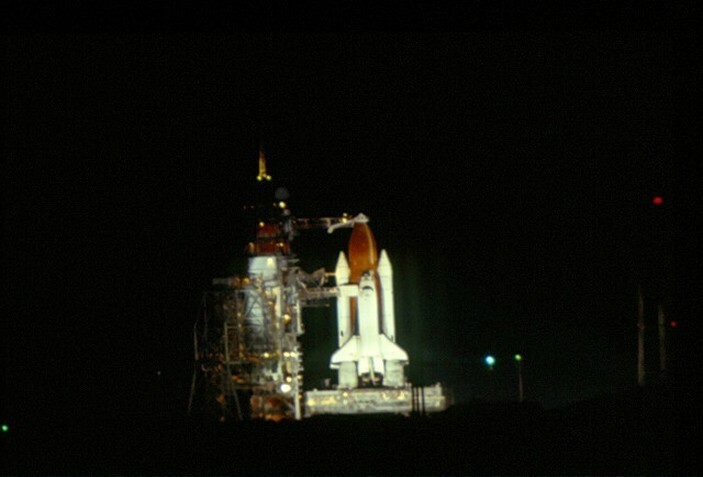 Once again, the roar of American "thunder in the skies" and the launch pad was empty once more. 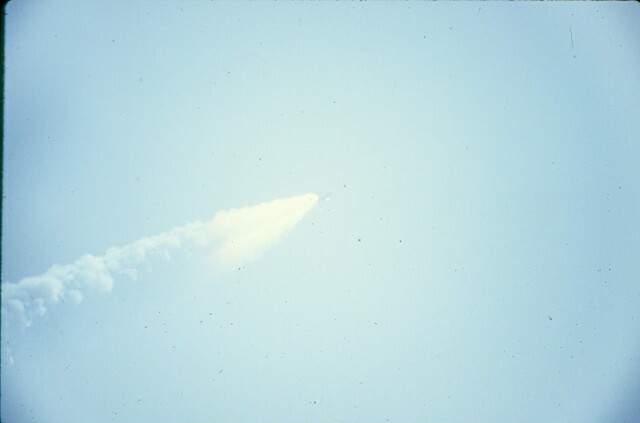 The SRB plume hung in the sky for a long time after launch, as there was virtually no wind. 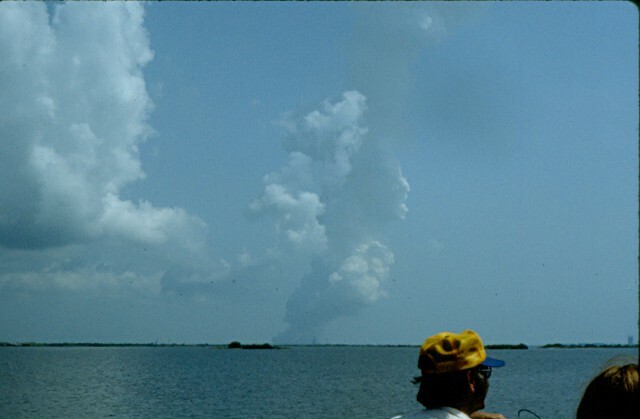 The tranquil waters of the Banana River, returned to nature once more and we bid good-bye once more to Shuttle Launch Complex 39 A.